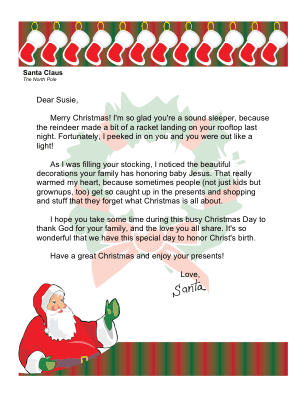 Christian families can keep the Santa Claus tradition alive while honoring the birth of Jesus with this printable letter from Santa referencing Christ and His teachings. Merry Christmas! I'm so glad you're a sound sleeper, because the reindeer made a bit of a racket landing on your rooftop last night. Fortunately, I peeked in on you and you were out like a light! As I was filling your stocking, I noticed the beautiful decorations your family has honoring baby Jesus. That really warmed my heart, because sometimes people (not just kids but grownups, too) get so caught up in the presents and shopping and stuff that they forget what Christmas is all about. I hope you take some time during this busy Christmas Day to thank God for your family, and the love you all share. It's so wonderful that we have this special day to honor Christ's birth. Have a great Christmas and enjoy your presents!